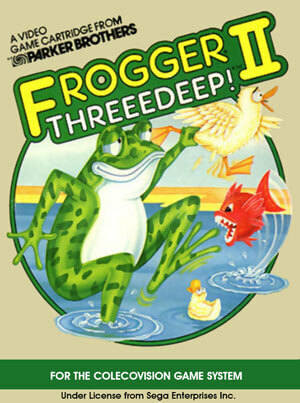 In Frogger II: ThreeeDeep!, you need to guide your frog to safety in three different locations. Starting out underwater, reach the top of the pond while avoiding dangerous alligators and fish (you can ride a turtle for safety!). 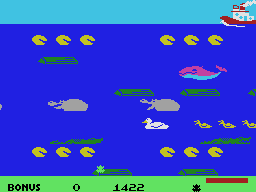 Once on top of the pond, hop across logs, birds, and even a whale to the life preserver trailing behind a tugboat. 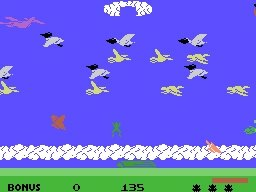 In the third location you have to hop across a flock of birds to reach a cloud at the top of the screen. 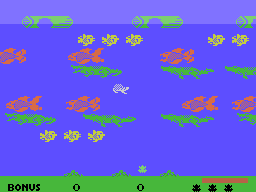 Each frog has a time limit to safely reach one of the homes on each of the three screens. 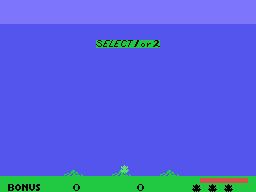 You move on to the next level when a frog has safely reached each of the homes on all screens.